Teekay Offshore offers attractive, high-yield (+10%), preferred shares, that are currently trading at a lower price than normal and thereby offering a relatively attractive entry point for investors. This article offers an explanation of why the shares sold-off, why the investment is attractive, and what are the big risks that investors should consider. We conclude with our views on the attractiveness of this high-yield opportunity. First, the entire market has sold-off. In a bit of “the baby has been thrown out with the bathwater,” the entire market has sold-off in recent weeks, and Teekay hasn’t been spared. In particular, many investors view Teekay Offshore as risky (that’s part of the reasons why the yield is so high in the first place). However, keep in mind these are preferred shares, not common, so they essentially have a face value of $25, and assuming the company isn’t going bankrupt, the shares should generally trade close to $25 (all else equal). In recent days they’ve been trading around only $20, or less. For starters, the company is now backed by deep-pocketed Brookfield. Specifically, Brookfield recapitalized Teekay Offshore in 2017, first taking a 60% position in Teekay’s L.P. units and 49% interest in the G.P., but then upping their G.P. interest to 51%, effectively giving Brookfield control. This move resulted in more discipline in the way Teekay Offshore is managed, such as controlling the dividend growth for the common shares (not the preferred), and allocating dollars more aligned with the company’s long-term interests. We can see evidence that the market has more faith in Teekay Offshore now because it was recently able to issue new debt thereby improving its debt maturity profile. The fact that investors were willing to purchase the bonds is a good sign for the health of Teekay Offshore. Teekay Offshore Partners, L.P., 8.50% Series B Cumulative Redeemable Preferred Units, liquidation preference $25 per unit, redeemable at the issuer's option on or after 4/20/2020 at $25 per unit plus accrued and unpaid dividends, and with no stated maturity. Cumulative distributions of 8.50% per annum ($2.125 per annum or $0.53125 per quarter) will be paid quarterly on 2/15, 5/15, 8/15 & 11/15 to holders of record on the record date that will be the fifth business day immediately preceding the payment date (NOTE: the ex-dividend date is at least 2 business days prior to the record date). Dividends paid by the preferred units are eligible for a preferential income tax rate of 15% to a maximum of 20% depending on the holder's tax bracket (and under normal holding restrictions) but, since they are issued by a foreign company, are NOT eligible for the dividends received deduction for corporate holders (see page S-84 of the prospectus for further information). This security was not rated by Moody’s or S&P at the time of its IPO. In regard to the payment of dividends and upon liquidation, the preferred shares rank junior to the company's senior debt, equally with other preferreds of the company, and senior to the common shares of the company. For more information, here is the IPO prospectus. Important to note, Teekay cannot redeem these preferred shares until 4/20/2020, and if they do redeem them then it will be at $25 per share, significantly higher than the current $18.70 market price (i.e. a price gain for investors, in addition to the dividend payments). Worth mentioning, Teekay Offshore also offers Series A and Series E preferred shares. The series E are more recently issued, and they offer an attractive fixed-to-floating rate feature that investors may want to consider if they’re concerned about the potential negative impacts of rising interest rates on preferred share prices. The fixed-to-floating rate is a feature bankers have been recently adding to new preferred share offerings to sweeten the deal, especially for investors concerned about rising interest rates. Another reason these preferred shares are attractive is because the company’s financial health has been improving. As shown in the following graphic from Teekay Offshore’s most recent investor presentation, cash flows continue to steadily improve, and contracts extend the receipt of those cash flows for years (this will help support the dividend payments). For example, TOO reduced its debt level from 7x EBITDA to a more manageable level of approximately 4.5x EBITDA. See: Teekay Turning The Ship. FPSO tanker leasing firms are being priced by the market today at 6x EBITDA, while shuttle tanker firms are being valued at 10x EBITDA... The shuttle tanker segment also has more stable cash flows than the FPSO/FSO segment, has less competition... and is not as integrated with the offshore well equipment... Teekay currently sells for 6x EBITDA based upon EBITDA generated from less-than-fully-utilized ships and temporarily discounted lease rates. Other FPSO/FSO leasers sell at multiples of 6x EBITDA while shuttle tankers sell at 10x EBITDA. At the current cash flow mix, the blended ratio is about 8x EBITDA. Given Teekay's leverage, if Teekay was valued at 8x EBITDA, the share price would increase by about 140%. 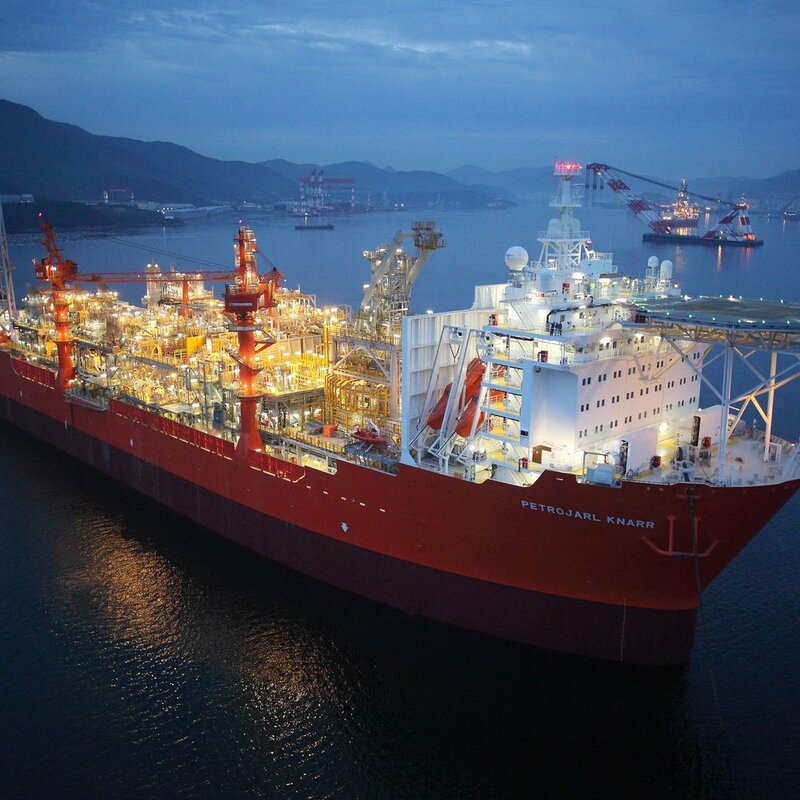 Moving forward, Teekay should become more of a shuttle tanker company with its multiple increasing to the shuttle tanker multiple from the FPSO/FSO tanker leasing multiple." KNOT Offshore: Tempting 10.3% Yield, But Know The Risks. Before investing in Teekay Offshore, investors should be aware of the big risks. For starters, credit spreads. Considering our recent market wide sell-off, things could get worse before they get better. And if this happens, credit spreads will widen, thereby causing essentially all high-yield securities (such as TOO.PB) to decrease in price, whether or not the business has deteriorated. Next, oil prices could get worse. No one can predict the future price of oil, but we can say with a decent amount of certainty that if oil prices continue to sell-off it will have a negative impact on Teekay’s preferred shares; not only because of Teekay Offshore’s relation to the oil industry, but also because as a high-yield security, it will very likely sell-off if oil price do (that’s just the nature of the way high-yield securities are priced and correlated). Finally, shipping industry supply and demand can be disrupted. For example, too much shipping supply can cause day rates to decline and could cause the business to struggle significantly. This is the nature of the industry. It’s a challenge Teekay has faced in the past, and will likely face again at some point in the future (when and to what extent, is too be seen). Remember, Teekay Offshore offers high yields on its preferred shares because they are perceived to be risky, and the market would not invest without the higher yield to compensate for the perceived risks. Teekay Offshore’s high-yield preferred shares have recently sold-off, thereby making them increasingly attractive, in our view. The business and industry are healthier than they were a few years ago, and the backing by Brookfield gives us added confidence. We also appreciate that the market may not be giving the company enough credit for its evolving shuttle tanker business. Further, cash flows have been steady, and are based on multi-year contracts. We view Teekay Offshore’s preferreds as one attractive option for a diversified income-focused investment portfolio. We understand this is a somewhat higher risk investment (that’s why the yield is so high--even though the preferreds are less risky than the common), and that’s why we prefer to diversify our investment portfolios across multiple diverse industries and market sectors. Depending on your situation and goals, we view TOO.PB as one attractive option for a diversified long-term investment portfolio.